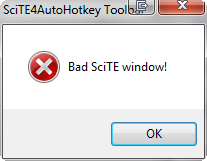 I'm noticing that SciTE4AutoHotkey (v3.0.04.01) does not properly load the toolbar when selecting multiple .ahk files, then right clicking a selected file in the group and selecting "Edit". It works fine when selecting and then right clicking "Edit" when you select the files individually. It slows down opening multiple files at once for editing projects that have #includes. Last edited by Grendahl on 21 Jan 2014, 14:26, edited 1 time in total. Cannot reproduce. I selected many files in File Explorer, right-clicked on them and selected "Edit". The toolbar did show up. It happens to me (not always) but usually this happens when the CPU is under load.. If I already have an .ahk script open and then multi-select and right click edit, it works fine. CPU is under 10% loading. I'm sure machine specs are plenty fine... and shouldn't be the root of the issue. (base) statusbar.text.2=$(BufferLength) characters in $(NbOfLines) lines. Selection: $(SelLength) characters. I just issued a potential fix for this problem as a downloadable hotfix. If you are not automatically prompted to download it, right click on the Toolbar and select "Check for updates". I uploaded attempted fix #2. Please redo the steps I mentioned earlier. Nevermind... I was able to manually launch the toolbar.ahk script and right click. I'll test and let you know. Last edited by Grendahl on 22 Jan 2014, 15:52, edited 1 time in total. Close SciTE, kill all InternalAHK.exe processes and open SciTE again (with one single file). OK. Went so far as to reboot the computer. Opened one script, toolbar worked fine. 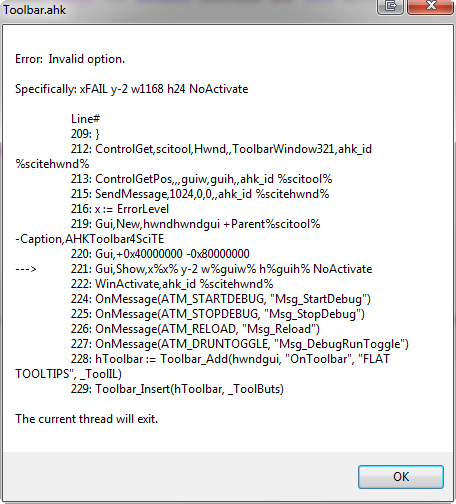 Clicked OK on the msgbox, and was shown an error in ResolveProp, line 18, \toolbar\SciTEDirector.ahk:50. Clicked Yes to try to continue running script, and got another ResolveProp error, line 19, same script. That fix #2 did the job. Before reading this I didn't know you could open multi files. At 75 one would think I'd have learned to read the help file. This is the best editor for AHK i have seen. Thanks for all your hard work. fincs wrote: Command #1 is 'Quick Run' for .ahk files; you're using a colliding command ID. In the mean time before I get to add dynamic command ID allocation for extensions (in order to avoid collisions), use #3. (1, 2, and 21 to 36 are taken). In addition to what fincs wrote, #10, 11 and 12 are taken also, though not explicitly. Also, the command #0 appears to be free, but it's probably reserved for special purposes. Last edited by trismarck on 24 Jan 2014, 13:56, edited 1 time in total. It looks like whenever I start by opening only one or two, I can then individually right click edit to open more files and S4A is happy. However, right click <edit> on three or more files and it chokes. It also chokes if I've had two files open, close SciTE, and right click <edit> another file. It tries to open the two former files as well as the new one, and chokes. This has never happened for me. It only loads the previous session if I run SciTE directly. If I Edit a file and SciTE isn't already running, it opens only that file. Thanks for sharing joedf! I find switching tabs annoying and this really helps. BTW- I learned a lot of SciTE features by watching this video. The column manipulation stuff (about 1/2 way through the video) was AMAZING! I am learning Python which uses column indention to signify things so it comes in very helpful. I found the video from this page which has some other helpful tweaks to apply to your setup file.